My dog Hunter is almost 15 years old. This is very old, especially for a large dog. I've had him since I was in 5th grade, and he's just always been there. My friend Emily recently said, "I can't believe Hunter's going to die," and she said it like she really couldn't believe it. I can't believe it either. I feel he may live forever. Although watch this blog post jinx him. I hope not. If you see my family wearing black for a month, you will know what happened. 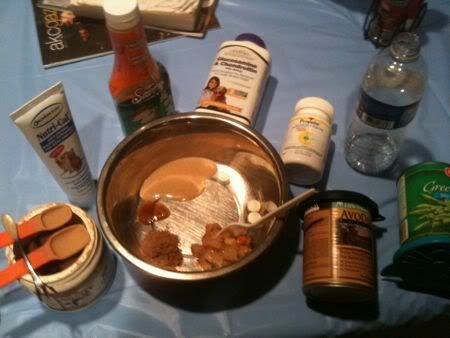 My mom asked me to dog sit, but first she had to explain how to prepare Hunter's dinner. She laid out all the ingredients and suggested I take a picture to help me remember. I've seen Top Chef recipes that had less ingredients. My mom tried to explain all the steps. Mom: First you measure out 1 and a half tablespoons of this holistic powder. Then, add 4 drops of this and 10 drops of this, followed by 2 pills from this bottle and one from this bottle. Posted in Friends & Family and tagged with Dogs. July 12, 2010 by Adele Chapin.